There's exciting news today from the Warner Archive: the October 25th release of a boxed set, the Jean Harlow 100th Anniversary Collection. Classic film fans have been anticipating this set for years. When it wasn't released for Harlow's centennial last March, it seemed the set might not happen after all, so this news was a very nice surprise. The set will include seven films: BOMBSHELL (1933), THE GIRL FROM MISSOURI (1934), RECKLESS (1935), RIFFRAFF (1936), SUZY (1936), PERSONAL PROPERTY (1937), and SARATOGA (1937). Harlow's costars in these films include Cary Grant, Robert Taylor, Clark Gable, Spencer Tracy, William Powell, and Franchot Tone. Three of the films -- BOMBSHELL, THE GIRL FROM MISSOURI, and RECKLESS -- have been remastered. Extras include the 1936 Lux Radio program MADAME SANS-GENE with Harlow, Robert Taylor, and Claude Rains. 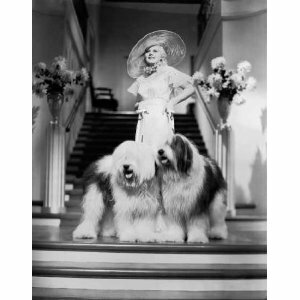 The set also includes half a dozen trailers and Harlow's pre-recording sessions for RECKLESS. There do not appear to be any commentaries or featurettes included in the set. The set will sell for $49.95. It would have been nice if this had been a regular retail release, as was once anticipated, but it appears the DVD market has permanently changed; the future of classic films will be manufactured on demand, other than a rare release like NIGHT FLIGHT (1933). Unlike NIGHT FLIGHT, released just this past summer, it appears the eagerly awaited release of THE CONSTANT NYMPH (1943) will also be from the Archive. Given the current realities of the market, it's exciting to see Warner Archive take another step forward, creating a boxed set with some remastered titles and extras at a comparatively reasonable price. It's been encouraging to follow the Archive's development, as in recent months the Archive has released many remastered titles and has begun to include extras with some releases. Hopefully the Harlow set will sell well and lead to more exciting Archive releases in the future! Friday Update: Lou Lumenick of the New York Post has additional information on the set. This is very exciting! I think Warner Archive is filling a void that the DVD/Blu-Ray industry is leaving by producing these MODs. I wasn't always happy with the idea but with their new packaging and now these collections, boxed sets and extras, I'm warming up to it. It's better than nothing right? 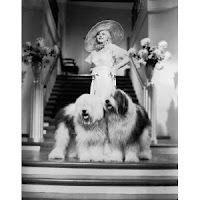 Glad to see so many Jean Harlow films on DVD now! Historically, and for a number of reasons, Saratoga should be remastered and offered as a stand alone product. "We also understand the disappointment that RED DUST and HOLD YOUR MAN were not included. We understand because we are equally disappionted. While all of these films are victims of years of wear, and their original negatives having been destroyed by the tragic fire in the '70s, the surviving elements for both DUST & MAN could not yield us a master of quality we deemed acceptable." "Our colleagues at WB Motion Picture Imaging have been conducting tests using new technologies that could improve heavily damaged B&W source elements. The team at MPI are specifically using sequences from RED DUST to try and address the serious damage inherent in the surviving material with the hopes that a superior image can be extracted from what we have left to work with."